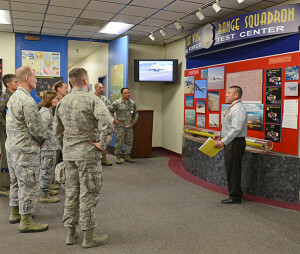 Frank Dones, 412th Range Squadron director of operations (right), discusses the squadron’s capabilities with Air Force colonels visiting Edwards to gain insight on test and evaluation execution and education, as well as how they can work with Edwards on future space test and evaluation programs. 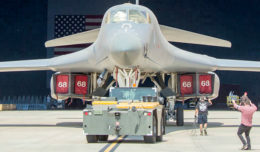 There’s no better way to learn about testing complex things than visiting Edwards Air Force Base in Southern California. That’s why the 412th Test Wing hosted a forum to discuss space test and evaluation Oct. 29, 2018. The day-long discussions included colonels from Air Force Space Command, Air Force Test Center, 412th TW, Arnold Engineering and Development Complex (in Tennessee), U.S. Air Force Test Pilot School and Headquarters, Air Force Test and Evaluation. The focus of the visit was the requirements needed for test and evaluation of Air Force space-based assets and what collaboration opportunities can exist between Air Force Space Command and the Air Force Test Center located at Edwards. Blake said the group discussed avenues of cooperation between AFTC and AFSPC in two areas: space test and evaluation execution and space test and evaluation education. Also discussed was how a multi-command Space Test Working Group is creating a new combined test force for space testing that includes both developmental and operational test. The Space CTF will determine requirements for the logistics and personnel needed for space test and evaluation. In between talks, the colonels were given a tour of Ridley Mission Control Center where they observed AFTC test conduct and control capabilities. They wrapped up the day at TPS where they interacted with current students to gain insight into current test and evaluation education. Blake said space assets are presently tested by both private contractors and the Air Force. Air Force Space Command is looking for ways to continue to strengthen the Air Force’s role in testing space assets. While this forum was not related to the new space force being discussed by the government, Blake said the discussions could be applied to a new space force.